Last week we had an example of a word that was originally written with a samech, but due to the similarity between that letter and a mem sofit, it began to be spelled with a mem in the end: leistes became listim. Today we'll look at another example. The phrase otzar balum אוצר בלום means "a storehouse". In Gittin 67a, we find that Rabbi Akiva was called an otzar balum - "a storehouse of knowledge." Rashi translates balum as closez - "compartments" (I think related to the English word "closet"). He derives it from the root בלם meaning "to curb, restrain" - which is the source of the word for "brakes" in Hebrew blamim בלמים. (Although you do hear Israelis use the foreign term brakesim, which is somewhat redundant - a double plural.) Rashi bases this understanding on Avot D'Rabbi Natan, which explains that just like a container can store different types of grain in closed compartments, so Rabbi Akiva would store different types of knowledge. 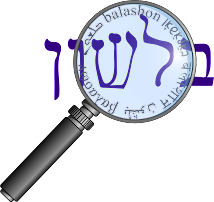 However, Tosafot point out that a different version of the text reads otzar balus אוצר בלוס - a "mixed" treasure. This too fits along with Avot D'Rabbi Natan, for Rabbi Akiva was a mixture of many types of knowledge. Based on this reading, Avshalom Kor claims that the switch from balus to balum was due to a misreading of mem sofit instead of samech. נֹטֶה צָפוֹן עַל-תֹּהוּ; תֹּלֶה אֶרֶץ, עַל-בְּלִימָה. "He it is who stretched out Tzafon over chaos; who suspended earth over emptiness (blima)"
The word blima here is actually made up of two word - bli בלי - "without" and ma מה- "anything". So it means "emptiness, nothingness". And in some editions of the Tanach, we find that the two words are separated with a hyphen: בלי-מה.